Experience the full power of Corona Discharge with patented ozone mixer and programmer. The Ozone pump and Injector is suspended inside the water storage tank. When the pump is activated, constricted water starts to vacuum ozone into the water stream, mixing & creating a high-velocity jet stream. 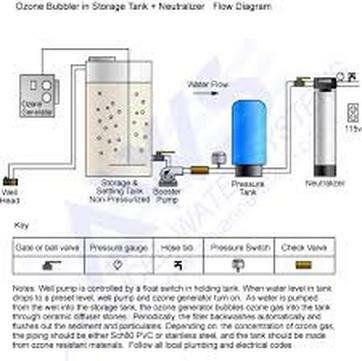 (see illustration below) The key here is for ozone to readily mix with the water. Thousands of micro ozone bubbles stay in the water long enough for the oxidation required. The process continues mixing the jet stream until the desired concentration is reached. Other ozone systems using UV lamps powered by an aquarium air pump cannot effectively dissolve ozone in the water stream and most of the ozone ends up in the air above the water line. CDP-XL-3000-115v Ozone System. FREE Shipping! Easy to install Dual Corona Discharge (CD). Includes Stainless Steel Water Pump , Patented Ozone Injector Module and installation kit. ​Easy to install Dual Corona Discharge (CD). 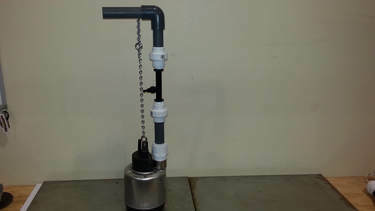 Includes Stainless Steel Water Pump and Patented Ozone Injector Module as pictured above. Includes installation kit. Patented Mazzei Injectors create thousands of micro ozone bubbles. 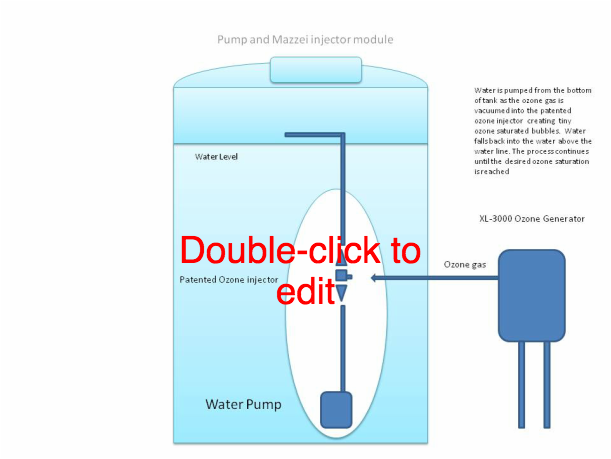 When pressurized water enters the injector inlet it produces a constriction causing ozone gas to be vacuumed up and mixed creating a high-velocity jet stream. FILTERS MEDIA incorporates a unique "slow trapping"
of precipitated sediment. Water becomes extremely clear! (NXTS1047) CLINOPTILOLITE MEDIA FILTER 10gpm. FREE Shipping! This is not your typical "sand filter" This Media is special and has been tested to the average size of the openings in the media all the way down to 3 micron! For example, a 20-micron filter has larger openings than a 5-micron filter. After installation we get huge reviews by our customers. In fact we encourage you to look at our reviews in terms of customer satisfaction, knowledge and product performance. Electronically controlled back washing system carries away unwanted Iron/Manganese/Sulfur Particulate. 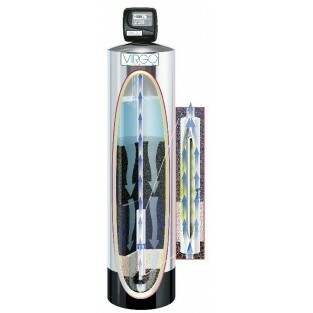 For the person who is looking for clear water with a low maintenance solution our unit is the superior filter choice. Less back washing than other leading brands. I promise ultra clear water every time! A typical design of recirculated ozone mixing with sand filtration. Above is a custom job we did this year for a customer with 4 separate wells. He consulted us regarding black and smelly water as well as connecting all the well pumps with a controller to operate and monitor them individually. What you see in the pictures is what we installed. The wells are in four separate locations on the 12 acre property. We connected each well pump control wire to individual toggle switches in the box on the wall. Now, with the flip of a switch he is able to run any or all of the four well pumps. With the water flow meter we installed he can watch and track performance on each pump. We also installed a Variable Frequency Drive (VFD) pump with one 10 gallon pressure tank. This pump operates the electric motor amperage, ramping up and down based on flow and demand and saving substantially on electricity. The pressure stays consistent by simply inputting the desired pressure into the computer. Instead of our standard timer, we used an ORP meter that turns the unit power on/off through a switch based on actual ozone content in the water. We used the VFD pump to loop and recirculate all four tanks through the large filter. 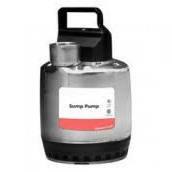 Our CDP-3000-XL uses a sump pump inside the tank. This ozone generator is custom built with 4 corona discharge units and a cooling fan. We can assist with any application. Most filters "in tank" cannot remove precipitated Iron/Sulfur/Manganese because when the filter is retrieved most of the precipitated sediment falls back into the tank. When installing the 3M cartridge on the main water supply entering the home a full 100% of the particulate is trapped. Thus producing clear and clean water. The 3M is designed with simplicity in mind. A quick release filter requires no tools. Included is a 1" Stainless Head and powder coated mounting bracket. 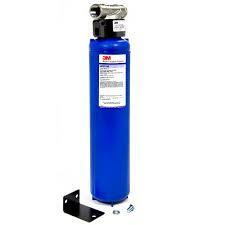 Replacement Ozone Pump for Model XL-3000-CDP Ozone System. UV: Made by the sun creates low concentrated ozone in the atmosphere. CD: Corona Discharge is more powerful as when a lightning storm occurs creating highly concentrated ozone. Corona is a made using a high voltage arc using cold spark technology. "Thanks for the follow up, Steve. The system is working great! The water tastes good and I no longer have to fool with that bulky filter inside my tank." Ozone (O3) is a naturally occurring compound in the form of a gas that is a powerful oxidizer and strong disinfectant. For more than 30 years the bottled water industry has been using ozone to effectively treat the water. The treatment ensures a quality product that customers pay a premium for. Treating water with ozone creates a product that tastes good and is aesthetically pleasing. Such water will please municipal customers not only because it is safe but because it is good-tasting water with fewer chemicals.